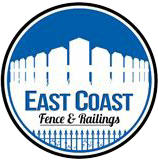 Whether you’re looking to have a new fence installed on a Long Island commercial property or simply to protect your home’s garden with a PVC fence, let the experts at East Coast Fence & Railings install it for you. Treat yourself to the fence you’ve always dreamed of for your Long Island home. While PVC fence tends to be Long Island’s most popular choice, we offer many other materials as well. Our knowledgeable technicians are familiar with every style we offer here, and will help you choose your favorite. PVC fence has quickly become an ideal choice for fencing on Long Island. This is because of its durability and ease of maintenance. In addition, numerous styles of PVC fence are available for any Long Island application. One classic style choice is picket fences, which are perfect for dividing gardens without obstructing their view. Giving off the appearance of a regal iron fence, aluminum is actually a superior material. Unlike iron, aluminum fences won’t rust over time and often are more affordable. As a result, they require little maintenance. They also tend to provide a more elegant appearance than a PVC fencing Long Island might. Commonly used in sports fields, parks, as well as factories, chain link fences can meet a variety of needs. They’re ideal for containing sports, as well as children and pets. In addition, if a chain link fence takes damage, the damaged chain link can easily be replaced. Although PVC fences have enjoyed increased popularity, wood fences have been a staple on Long Island for years. They’re also a great choice for classic white picket fences. Nothing can really compare to the quaint look that a wood fence provides when used to enclose a garden in your Long Island home. It’s how we are able to create beautiful and long-lasting wood designs. Keep your children and pets safe from drowning by installing a pool fence in your Long Island home. It’s an attractive way to protect your pool and prevent others entering in unsupervised. All of our pool fences are complete custom, so you’ll have a truly unique finished product that matches your landscape. We can also construct them out of metal, glass, or wood. If you’re ready to add Fencing Long Island to your property, or perhaps replace your existing one with a PVC fence, call East Coast Fence & Railings today at 516-286-2236. We’ll provide you with a free estimate!